GRATEFUL: Johan Sandberg from Eidsvåg in Romsdal came to the meeting to thank Svein-Magne Pedersen for all his prayers. For a long time he struggled with psoriatic arthritis, but after several rounds of prayer the plagues disappeared. Two years ago, Johan Sandberg from Eidsvåg i Romsdal got severe pain in the body due to psoriatic arthritis. After receiving prayer from Svein-Magne Pedersen the pain left step by step. I have heard Svein-Magne Pedersen preach on different ways healing can come about. One of them is «step by step healing» When it comes to this type of healing, it comes in different stages, and this is how it happened in this case. I am glad I did not give up, Johan Sandberg says happily. Sandberg is a skilled and dexterous woodcarver, and has carved a number of knives, clocks and mirrors and a many other items of wood. After a period of intense work in June 2012, the joints of his fingers were very inflamed. Unfortunately the pain did not go away, but spread throughout the body. The report from the doctor was that Sandberg had psoriatic arthritis. -I had pain in several joints in the body. The pain grew to be so drastic that I had to use pain killers. It was worst in my hands, back, feet and the soles of my feet. Everydaylife became exhausting, and not much work was done during this time. In May, 2003 Sandberg made the trip to Kristiansund where Pedersen was having meetings. He was hoping for a miracle. He had been suffering for nearly a year with pain. -Unfortunately I experienced my body worsening after the weekend meetings. My neck in particular got to be very stiff. I was a little disappointed, but I would not give up, he says. One month later Pedersen had meetings in the town of Grovfjord. Sandberg made the trip from Eidsvåg i Romsdal. He was going there because he had connections to this community, but also to receive prayer again. -Then I experienced all the pain disappearing for four days. It was a few days of heaven on earth, but unfortunately the pain came back. The good thing was that the pain in my hands had disappeared, and that was a step in the right direction. -After 14 days, the pain came back, but now the pain in the neck was gone. Again I called Pedersen and was fully recovered in two days. The arthritis came back again, but now the pain in my back and hips were gone. Now it was just the feet left which were plagued by psoriatic arthritis. After some time Sandberg went to see a rheumatologist who examined his feet. He wanted to give him mild chemotherapy that would curb the symptoms. -Just before I was to begin with the treatment I was suddenly hit by intense diarrhea and vomiting. It went so far that I had to go to the hospital to get intravenous because of malnutrition. The doctors did not permit me to start a chemotherapy treatment. After a few days I started recovering. The pain in my feet had disappeared. I believe God made use of the diarrhea symptoms to prevent me from starting the chemotherapy. He wanted to fix my feet himself, Sandberg says and smiles. Sandberg has now gone one year without arthritis. He has cut out medication, and is enjoying life without pain. -I must strengthen the joints some, but otherwise it is good to be without joint symptoms. It's incredibly wonderful has happened. I told the doctor what happened. He was happy on my behalf, but but said nothing more. Also, many friends have heard my story. I hand out the magazine healing and advise people to call Pedersen. The weekend of June 7-8 this year Svein-Magne Pedersen came to Grovfjord again. 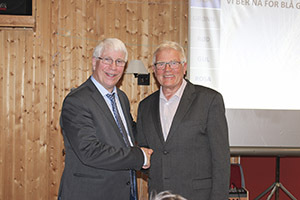 Sandberg came for a scheduled visit to Grovfjord, and came to the meeting to thank Pedersen. He also testified for the audience about what had happened.